Another angel from heaven proclaims the fall of mystical Babylon. (1-3) A voice from heaven admonishes the people of God, lest they partake of her plagues. (4-8) The lamentations over her. (9-19) The church called upon to rejoice in her utter ruin. (20-24)1-8 The downfal and destruction of the mystical Babylon are determined in the counsels of God. Another angel comes from heaven. This seems to be Christ himself, coming to destroy his enemies, and to shed abroad the light of his gospel through all nations. The wickedness of this Babylon was very great; she had forsaken the true God, and set up idols, and had drawn all sorts of men into spiritual adultery, and by her wealth and luxury kept them in her interest. The spiritual merchandise, by which multitudes have wickedly lived in wealth, by the sins and follies of mankind, seems principally intended. Fair warning is given to all that expect mercy from God, that they should not only come out of this Babylon, but assist in her destruction. God may have a people even in Babylon. But God's people shall be called out of Babylon, and called effectually, while those that partake with wicked men in their sins, must receive of their plagues. 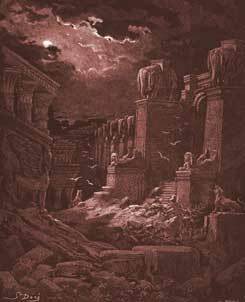 9-19 The mourners had shared Babylon's sensual pleasures, and gained by her wealth and trade. The kings of the earth, whom she flattered into idolatry, allowing them to be tyrannical over their subjects, while obedient to her; and the merchants, those who trafficked for her indulgences, pardons, and honours; these mourn. Babylon's friends partook her sinful pleasures and profits, but are not willing to share her plagues. The spirit of antichrist is a worldly spirit, and that sorrow is a mere worldly sorrow; they do not lament for the anger of God, but for the loss of outward comforts. The magnificence and riches of the ungodly will avail them nothing, but will render the vengeance harder to be borne. The spiritual merchandise is here alluded to, when not only slaves, but the souls of men, are mentioned as articles of commerce, to the destroying the souls of millions. Nor has this been peculiar to the Roman antichrist, and only her guilt. But let prosperous traders learn, with all their gains, to get the unsearchable riches of Christ; otherwise; even in this life, they may have to mourn that riches make to themselves wings and fly away, and that all the fruits their souls lusted after, are departed from them. Death, at any rate, will soon end their commerce, and all the riches of the ungodly will be exchanged, not only for the coffin and the worm, but for the fire that cannot be quenched. 20-24 That which is matter of rejoicing to the servants of God on earth, is matter of rejoicing to the angels in heaven. The apostles, who are honoured and daily worshipped at Rome in an idolatrous manner, will rejoice in her fall. The fall of Babylon was an act of God's justice. And because it was a final ruin, this enemy should never molest them any more; of this they were assured by a sign. Let us take warning from the things which brought others to destruction, and let us set our affections on things above, when we consider the changeable nature of earthly things. America alone is NOT Mystery Babylon the great. Vs. 1 the great whore sitteeth on many waters. In revelations Babylon represents America. It is the nation which everyone drinks from also known as the eagle- America's symbol. it is the queen of sin. It also speaks of the bear, which is the symbol for Russia. We see so many things going on between Russia and America in the news right now. Russia is the next super power. this book is real-its not just the past, its past, present, and future. If your only tool is a hammer ,everything looks like a nail (or, Roman Catholic) it amazes me how so many preachers completely overlook the parts that talk repeatedly about the wealthiest nation that will be destroyed that the kings of the earth will be totally destrought because they can't do business anymore, that is NOT Rome! 1-24 above we see Jehovah / GOD (again) cut-off his blessing to a nation; it is nothing new under the sun because GOD took the same action against the nation /people HE led into the land promised to Abraham; both nations receive the wrath of GOD because they preferred to love and practice sin more the GOD word. the ..., ..., will not be able to bail her out. Through the BLOOD my bags are packed. Shane, Lm I concur because from Dr. Martin L. King to Dr. Billy Graham and many other modern day saints and prophets have warned us to return to our God the God of Israel and the forefathers of the documents of our nation to help the poor, farther less, and widows but we have not heeded the warnings. Ps. 9:17 says, The wicked shall be turned into hell, and all the nations that forget. Amen! shane .....right on!!!!! amen! !! The Babylon spoken of here is America. There can be no doubt. "One Nation Under God" seems to be less than half a nation under God these days. It seems that we've thrown away, that which made us great. Just as Isreal did, we have turned our back on God. We, as a nation will be "thrown down" and merchants the world over will weep for there will be no America to buy their goods anymore. REV 18:23 Meaning was relevant then and even more relevant today. It means the human light or spirit is not bright due to the weathy merchants aka masters of this world-Evil Corporations that spin lies, illusions or sorcery on all humans and all the countries are deceived. Eg. Medi-Pharma Cartells that kill Pharmakia in ancient Greek: Sorcery or creating spells with illusions, potions and drugs. What Do You Think of Revelation 18? Why is Babylon destroyed in the end times?